I've decided to institute a new rhetorical policy in my life. Since I'm chronically indecisive, and since I'm always trying out new foods and new recipes, from now on any "favorite" dishes of mine will have to be the favorite of the day. Otherwise, everything would be my favorite. When I first started making my chickpea salad, it was definitely my favorite salad. Such texture! So lemon-minty! So fresh! And then came this delicious little number, my carrot and fennel salad. A new favorite, for sure. There is something special about the success of a new dish, especially one that you've created yourself. Just eating something that you've never had before, whether it's one special ingredient or a bold, new combination of flavors, is exhilarating in and of itself. So I guess that's why every dish I try is soon proclaimed "the best soup I've ever had," or "the yummiest salad ever," or "the ooiest-gooiest, freaking best pumpkin-cranberry cookies ever to have graced the universe with their presence" (Whole Foods pumpkin-cranberry cookies, October 2007). In any case, favorites will now be favorites, but for their designated time. Perhaps I'll allow for some truly great dishes to be forever favorites, but for now I'll work with favorites of the day. Today's is an amazingly simple spinach salad with a tahini dressing. The dressing was actually a sauce I made to accompany some sesame-crusted chicken breasts a few nights ago, but I had a bit left over, was craving something green, and a new favorite was born. 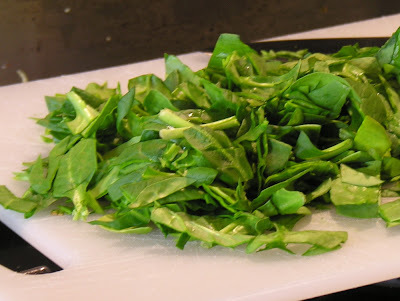 When it comes to salad, I often try to pack as much vegetable as I can into the thing, but it's easy to forget how delicious fresh baby spinach is, all on its own. Really, try it sometime - straight from the bag (or in my case, obscenely awkward and large Olivia's Organics plastic container). It's really good. This salad has only three components: spinach, chopped kalamata olives, and dressing. I like to slice my baby spinach roughly into ribbons, because I like how it sits on the plate that way. I find that the whole leaves can be a bit unwieldy. I also like to have this salad slightly warm, which softens the leaves just a tiny bit without actually cooking them. I just toss my greens in a bowl, cover with a plate, and microwave for 30 seconds or so. It makes such a simple salad seem a bit more elegant. The key, of course, is the tahini dressing. It has a nice lemony bite and a subtle, pleasant bitterness from the tahini. The olives give it an extra boost of Mediterranean-ness, but this salad would go perfectly with just about any meal. Yum! Make dressing: Mix first four ingredients and whisk to combine. Add a splash of oil and whisk again. Season to taste, adding more honey if necessary. For a thinner consistency, add a splash of water. 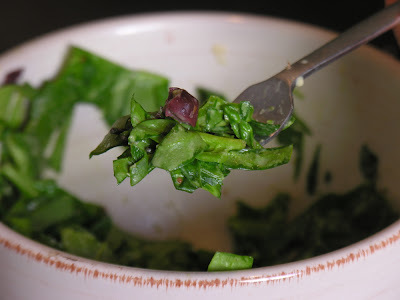 For salad, roughly chop spinach and place in a microwave-safe bowl. Cover and microwave just until warm, about 30 seconds. 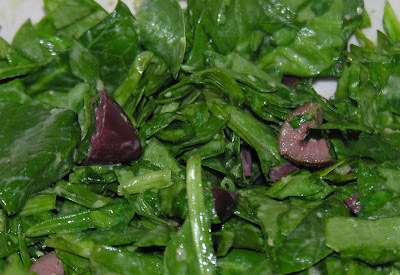 Chop kalamata olives and add to warm spinach. Dress each salad with a few tablespoons of dressing, and toss (or cover with a plate and shake!) to combine. Serve immediately. This can eat salad three times a day and this looks just delicious! But when I make this, I'll have to use double the amount of coarse grained mustard. I love mustard! !